Vines are the easy answer to so many garden challenges. How to add height to your plantings? How to add texture to your fences and wall or screen out unwanted views? How to bring in a little drama? Ornamental vines do it all. When placed well, climbing plants add wow-power to your backyard and beauty to your garden. The trick is to be a good matchmaker and pick an appropriate vine for the location you have in mind. Consider these spectacular vine plants with eye-popping displays to delight your family and insight vine-envy in neighbors. No matter where you live in the country, the trumpet vine (Campsis radicans) will very likely thrive in your yard. This hardy native vine is a survivor, growing in zones 4 through 10, which means surviving icy winters of the Northeast and Midwest and steamy summers in the South. 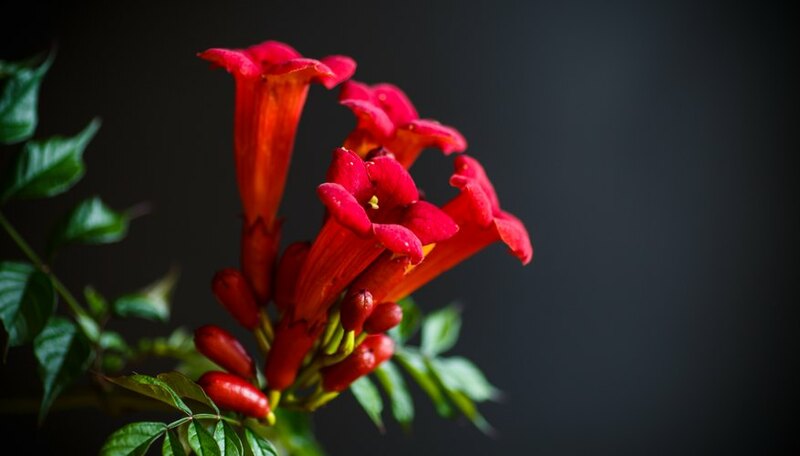 These flowers look like little trumpets appearing in bright reds, oranges or yellows and contrasting well against the dark green foliage. The shapely blossoms attract hummers and butterflies as well as bees. The leaves are so dense and the vine so large that it's great for privacy walls as well. It grows vertically, quickly covering chain-link fences and sturdy wooden or metal fences. Best to plant the trumpet vine in a large planter. This prevents runners from spreading across the backyard. Put it in full sun and watch it go. Don't plant it against a building since the vine climbs with aerial rootlets that may cause structural damage. Let's get invasiveness issues out of the way first. While some honeysuckle species (Japanese honeysuckle, for one) are invasive imports, coral honeysuckle (Lonicera sempervirens) is not. It's a native wildflower vine, hardy in zones 4 through 10, which means almost anywhere in the continental United States. This honeysuckle grows fast and well, but won't take over the neighborhood. 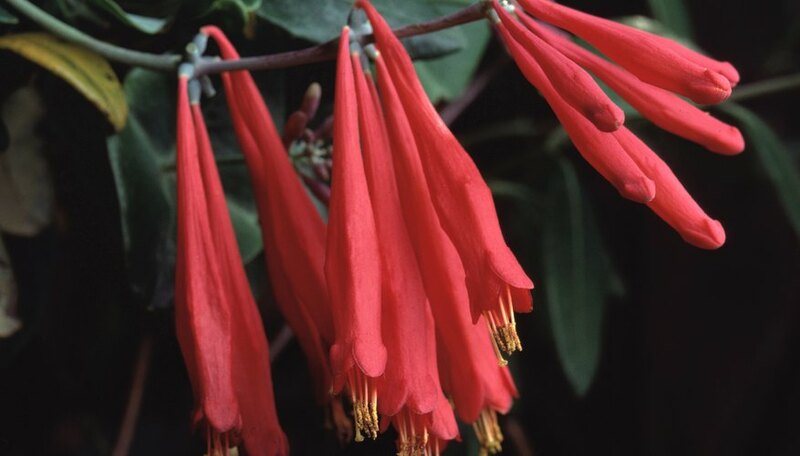 Coral honeysuckle is a twining vine with long, trumpet-shaped, fragrant blossoms in shades of coral pink, red or yellow. These flowers delight any hummingbirds and butterflies in the area, and the vines' second act, small red berries, feed songbirds. A coral honeysuckle vine grows to 25 feet long, an attractive and easy-care alternative to its invasive cousins. Plant it in full or partial sun. Once established, it tolerates heat and drought and takes little maintenance. Purple hyacinth bean vine (Dolichos lablab purpureus) fills a large fence or wall quickly and costs you little to get started. It's an annual, so you can grow it yourself from seeds. The seedlings leaf out rapidly, grow fast and blossom quickly and profusely. This vine is a legume, like peas and beans, and it climbs by twining. The entire plant is lovely, from the crimson stems to the shiny green leaves. The delicate, lilac-rose flowers keep coming all summer long and have that charming pea-flower look. You'll be equally thrilled with the 3-inch-long, ruby-purple bean pods that develop under the flowers. The vine grows quickly to 10 feet tall without a lot of help, and it doubles as a nitrogen-fixer, invaluable in the garden. 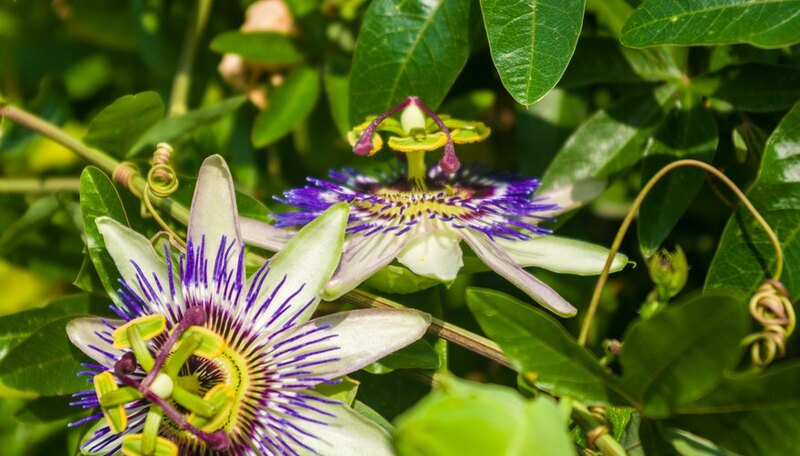 Passionflower vine (Passiflora Incarnata ‘Maypop’) produces some of the most incredible blossoms of any plant on earth. Some 3 inches in diameter, the blossoms have broad petals in purple and pink pastel hues, with a center of frizzy strands in a canary-yellow middle. Each blossom is eye-popping and miraculous, almost a work of art. The flowers are followed by large, edible fruit, egg-shaped and acid yellow, that taste delicious with a grape-like flavor. 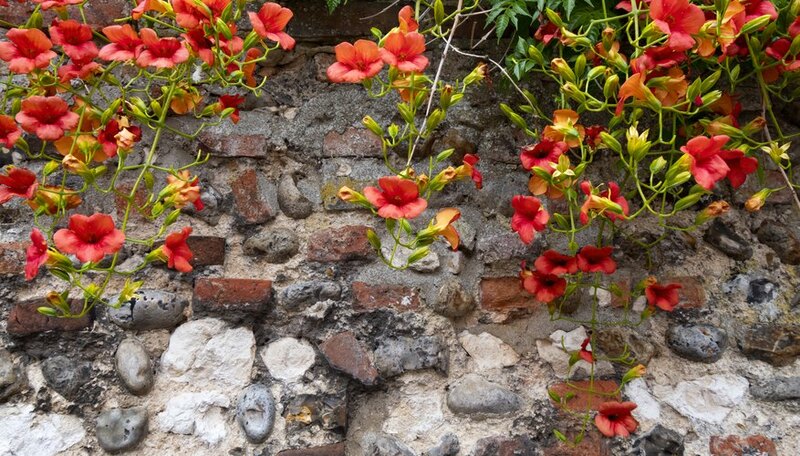 The vine will thrive on a sunny fence or wall in zones 6 through 11. Wisteria (Wisteria spp.) 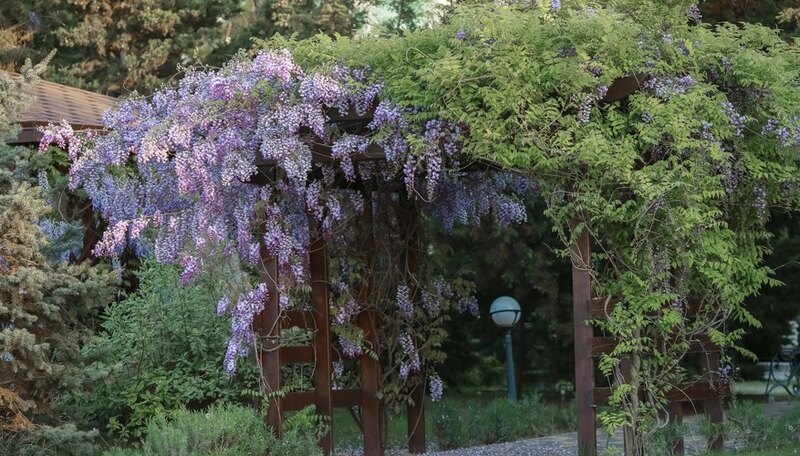 is a high-climbing vine with spectacular cascades of lilac flowers in springtime. It's a fast-growing vine, often getting 30 feet long. Flowers come thick and fast, but only appear on new growth. 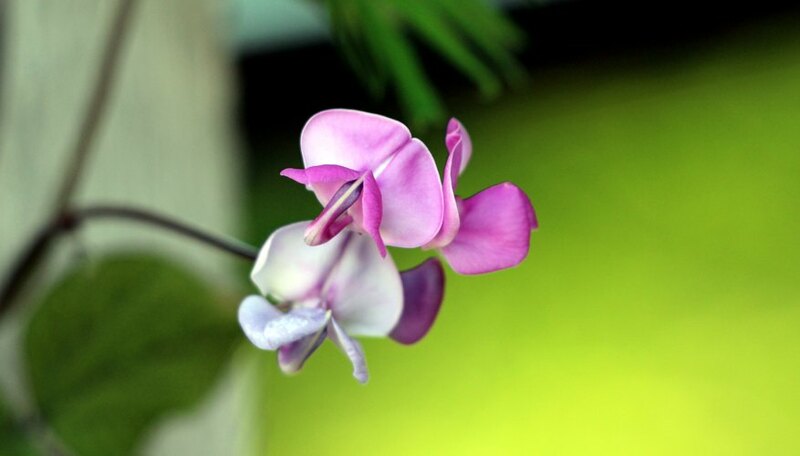 Wisteria flowers are very romantic and beautifully fragrant, a true sensual feast. The resulting attractive bean-pods hang on the vine until winter. Pick one of the native wisteria species, American wisteria (Wisteria frutescens) and Kentucky wisteria (Wisteria macrostachya). They are far preferable to the aggressive Asian wisteria. Plant your wisteria vine in well-drained soil in a full sun location. How about partial shade? Well, you'll get the foliage, but not those stunning flowers. Give some thought to where to place them since these vines need a very sturdy structure to climb. DenGarden: Hyacinth Bean Vines Grow Like Magic!